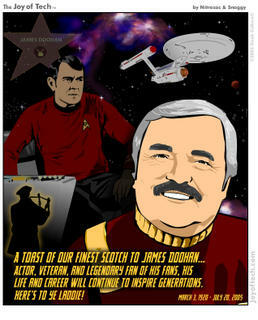 The BBC is reporting that the ashes of TV's James Doohan, who died yesterday at age 85, will be sent into space, at his request. His agent, according to the Beeb, said Doohan and his wife, Wende, had discussed sending his ashes into space, following those of Star Trek creator Gene Roddenberry. Space Services Inc. said Doohan's ashes could be on a Falcon 1 rocket launching from California's Vandenberg Air Force Base, tentatively scheduled for launch in September. A very cool tribute indeed! Even the normally snarky Joy of Tech has a tribute. Farewell, Scotty. The universe just won't be the same without you, nor will the warp drive ever run as smoothly. Ars Technica bids farewell to Doohan too, but uncharacteriscally, Wired is mum.